If you haven't heard yet, Polish Pickup is a shop where you can nominate and vote on monthly themes and indie makers make polishes based around that theme which you can then pick up in the shop! It's been running for a few months so far and I love it - the way they set it up you can buy as many or as few polishes as you want, and there's $3 flat rate shipping to Canada and the US! Hooray! I've been able to try out a BUNCH of new indie brands because of this which is awesome. The polish I have to share with you today is from the April Polish Pickup theme of 'Works of Art'. I'm sorry to say I can't remember which painting this was inspired by, but I can tell you it's from a brand that is brand new to me: Chirality Polish! The painting that was used for the inspiration was one with a lot of dots in it, and fittingly enough Chirality Polish decided to name this polish A Lot of Circles. 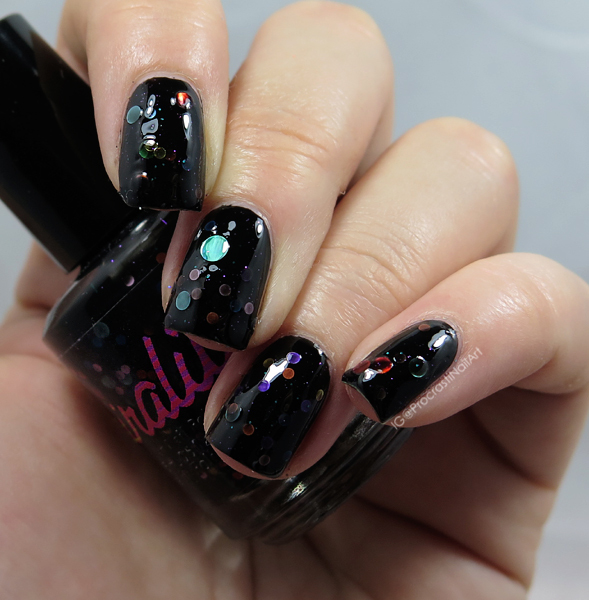 Who doesn't love circle glitter?! 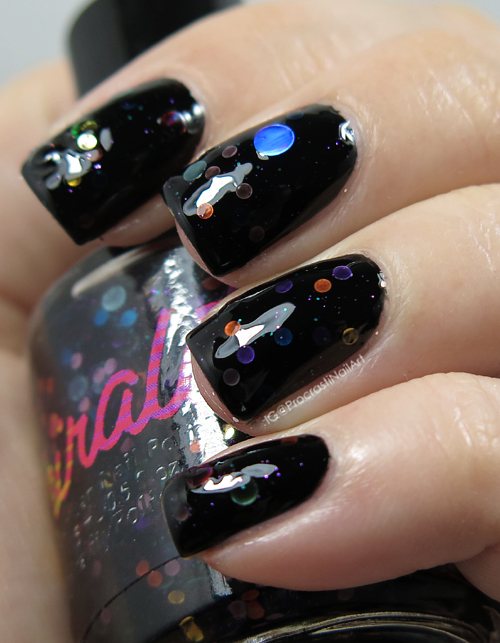 This polish is a sheer-ish black jelly packed with all sizes and colours of circle glitter. There are also tiny turquoise and purple hex glitter, which make the base a bit more interesting. :) And the nice thing was that I didn't have to fish for the glitter! Since this polish is so sheer I decided to layer two coats over one coat of Ceramic Glaze Little Black Dress. You could wear it on your own too but it would take at least 3 or 4 coats to build up properly, I think. Since this polish was exclusive to PP I don't think you can pick it up unless you can find it in a destash, but that doesn't mean you can't still enjoy my swatches and oooh and aahh over it! :) And if you like it hey, maybe that means you should check out the next round of PP shades! Maybe you will find some that you will love just as much as I love this one! So that's it for today! I have a whole bunch of PP shades I've picked up since April so I'm sure I'll have more swatches for you in the coming weeks. Our theme for next month is cocktails and mocktails and I can tell you there have already been some beauties previewed in the facebook group! Have you ever picked up polishes from the Polish Pickup? :) Does it seem like the type of shopping experience you would like? Let me know! I like the look of this polish a lot! 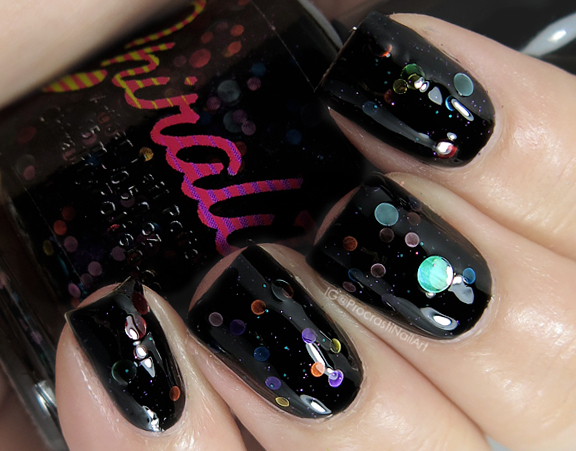 Circle glitters are always fun! I love the polish Pickup. It's such a fun concept. Circle glitters are so fun! Holy bubbles! I love this polish and I agree, Polish Pickup has me getting new brands every month! I really like that the base color is translucent enough to let the glitters shown through. And I agree the Polish Pickup is a great way to try new brands. I've got 3 new ones on the way to me right now in fact! Black jellies are so much fun!